The entire conversation stopped and the silence was deafening. The group went on to discuss what we each believed was our purpose while at the same time encouraging the young brother to find his purpose. I found the brother’s comment to be extremely alarming. Even more disturbing was my ignorance of how some young people feel in our country and I wondered how many other young Bermudians feel the exact same way. How many young men or women are walking through life believing that they have no purpose or have lost hope? I made international contributions as part of a CARICOM regional Technical Working Group. The stars seemed to have all aligned for me. The job was advertised, I applied but I was neither offered the job nor an opportunity to under-fill the position. At the time, the Director stated that sometimes the best person doesn’t get the job and alluded that I had a greater purpose. I thought those words were offered merely to provide me with some form of comfort. I did not understand what she had meant at the time and it was, admittedly, a very hard pill to swallow. However, I now realise that often times God sees something in us that perhaps we could not possibly see in ourselves. I now live according to God’s will and, as a result, I believe He has called me to use my skills to represent, advocate for and assist both the working class as well those struggling in Bermuda. I have accepted that while my aim was to become Bermuda’s Economic Statistician that was not God’s plan for me. I have now embraced my purpose; one of service to my community and the workers of this country. Growing up, I would have never imagined that I would hold such a position with so much responsibility, however, the experiences I have had throughout my life have helped shape me into the man I am today. I also believe that positive change in the world begins first when we commit to changing ourselves as individuals. 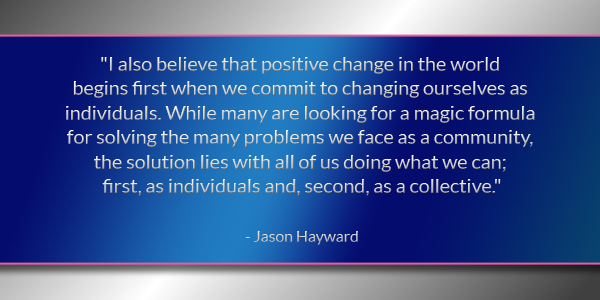 While many are looking for a magic formula for solving the many problems we face as a community, the solution lies with all of us doing what we can; first, as individuals and, second, as a collective. I encourage persons to embrace a value-added lifestyle. Commit to engage in activities that add value to your life and the lives of others. Activities that don’t add any value, choose not to engage in them. I have embraced a value-added lifestyle and, as a result, I have become a better father to my kids and my physical, mental, financial and spiritual health have all improved. Improving as an individual has given me a greater capacity to add value to my community. A value-added lifestyle forces us to make an inward reflection. It forces us to take a critical look at our actions and decisions, and determine if they are in our best interest or in the best interest of the community. Rather than trying to solve the difficult problems of how we can address issues as a collective, I encourage you to do all that you can as an individual. Ask yourself: “Do you have the capacity to add greater value to your life and the community?” If the answer is “Yes”, next ask: “What is limiting you?” If, however, the answer is “No”, ask yourself the very same question: “What is limiting you? It is never too late for persons to find their purpose. My life has been far from rosy but I have accepted the fact that God never promised us a life of convenience. I encourage you to embrace your purpose and push through whatever adversities you may face. Humble this man is not. I have attended meetings where he has cut members off while they were talking, all the while pushing what HE thought should happen. He needs to remember, the members pay him and therefore THEY are the boss!! Hayward is making a futile attempt at damage control and restoring his image. The damage is done, no matter how one tries to fix that broken glass. It is not often that I would agree with you Mr. Hayward but THANK YOU. Well said. We are in charge of our own destiny. The only limits are the limits we impose upon ourselves. Stop blaming others and get on with improving your own personal and professional development and welbeing. Attitude equals Altitude. It truely does. A great article Jason! Finding one’s purpose is paramount to enjoying a fulfilled, blessed, happy and prosperous life. I had the opportunity to work at the Statistic’s Office for 5 months from Nov 2010 to Mar 2011 to witness first hand your great work ethic and character traits. Keep serving. One would think that working in the “Statistic’s Office” (sic) you would have learned how to pluralise a word. Keep being the emerging voice of your generation my brother. Your message was the right one for the times. I have to “smile” when reading or hearing these representatives of Unions referring to one another as “brother/s” They claim to be helping one another while they’re out for themselves. If u’lot are truly concerned about your so called, “brothers” then why not consider them less fortunate? I don’t make comments on blogs or articles but after reading this I felt compelled to share my thoughts. This hit home for me and I totally agree with these positive words of wisdom. He’s right about one thing. His destiny was not to become a statistician, he’s far better at being a BS Artist. But not better then Fayhe The Usurper , Jason is a people person , the people love him , they embrace him and respect him , unlike the Usurper , a BS Artist with a law degree to prove it . Congratulations Jason, it must be so empowering to know that god is taking such a personal interest in YOUR career development and is taking time out from his busy schedule to publically endorse YOU. We are all so proud of you and wish you continued career success. Even Donald Trump can’t claim to have the type of personal campaign support that you have – imagine if god took the same personal interest in ‘The Donald’ as he has taken in YOU! Imagine if Fahye had wrote this! Actions speak louder than words. What a turnaround. Let’s hope that this is indeed Jason’s way forward. I wouldn’t have said his actions last week were in keeping with this week’s philosophy. The act of sincerity can be changed to suit the need! Thank You Jason, you are truly a blessing to the younger generation. We know we have a voice in you. We appreciate it, One Love!! Make no comment Jason. You are being molded and shaped into an outstanding leader! Press on. Press on. Press on. Those that have eyes to see are looking; those that have ears to hear are listening. Many will not see and many will not hear! First of all, this young man was probably in a lifestyle where death was evitably knocking on his door soon. Young people do not feel this way. And he was one out of many who think live life in the fast way because they don’t have a better understanding to life. If your parents/guardians laid a well foundation and given you the tools to build on that foundation than that little comment that young man said would have never came out his mouth. Also it shows his immaturity of life. I hope this one young man is not what you see all young people Mr. Hayward. I just wanted to ensure on that. But like most young man and women they have no vision and no stepping stones. And with that being said it is why some of us will fail on life,pick the wrong path and probably end up in a coffin before 40 because of this lifestyle.